The product is intended for traditional use in the above indications. Its effectiveness is based only on long-term use. 100 g of the product contains: complex liquid extract (0.65:1) from: chamomile anthodium (Matricaria recutita L.), oak bark (Quercus spp. ), sage leaves (Salvia officinalis L.), arnica herb (Arnica montana L.), calamus rhizome (Acorus calamus L.), peppermint herb (Mentha piperita L.), thyme herb (Thymus spp.) (2/2/2/1/1/1/1) – 50 g.
Allergy to the active ingredients and arnica, chamomile, or other aster family (Asteraceae, formerly Compositae) plants, mint, oak bark, sage leaves, calamus rhizome, thyme, benzocaine, or any of the remaining ingredients of the medicine. In case of package without applicator apply the product to the affected sites in the oral cavity with the use of a cotton swab. In case of package with applicator, apply one dose to the affected sites in the oral cavity. 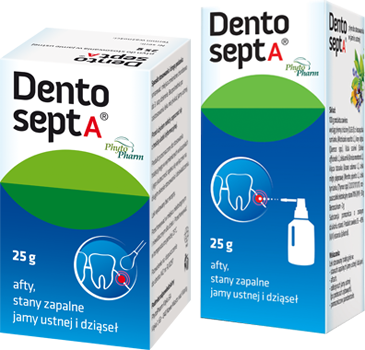 Up to 5 doses of the preparation can be applied at different oral lesions. The maximum daily dose is 15 doses. The applicator’s distance from the application site should be in the range of approximately 1 cm to 5 cm. Do not rinse your mouth immediately after using the medicine. If the symptoms worsen or persist after 7 days during the use of the medicinal product, a doctor should be consulted. The drug can be used to relieve symptoms. Do not use the drug in children under 12 years of age due to the content of benzocaine and ethanol, unless the doctor decides otherwise.